How you choose to landscape and construct the area immediately surrounding your pool will make a big difference between a nice pool and a gorgeous pool. Considering how important your pool is to the look of your home, it’s strange that a lot of homeowners don’t put nearly enough thought into the deck. Before you consult with pool builders in Vero Beach, FL, here are some pool paver designs you might want to consider. If it’s good enough for ancient Romans, it’s good enough for you! Travertine is a popular material because of its strength and its lasting beauty. It’s also perfect for swimming pools because it’s porous – to prevent slipping – and it’s cool to the touch, even on hot days. That’s welcome news for bare feet! 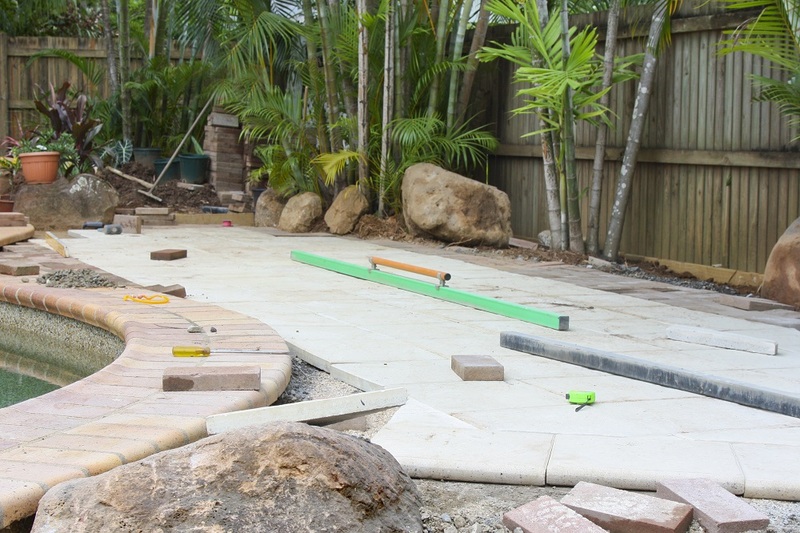 Flagstone is a generic term that refers to any kind of stone that resembles a flat slab of natural-looking paving. It’ll often be brown, and will look rough even though it isn’t. It’s also slip and heat-resistant. A popular type of flagstone, slate is heavy and strong, and can be cut into practically any shape. The shades that are available in slate range from a blonde or rust color, all the way to purple and blue-grays. Not as blue as it sounds, this flagstone-type material tends to be more blue-gray and is commonly quarried in New York and Pennsylvania. Bluestone is usually finished in one of three ways: a uniform “thermal”; a non-uniform “natural cleft”; and the smoother “honed” finish. Limestone is one of the world’s most beautiful and popular stones. Strong, yet delicate, it’s able to retain its elegance for years. Perfect for decks as well as pool coping, limestone comes in a wide variety of colors such as tan, brown, pink, and gray. A sedimentary rock composed mostly of quartz grains, sandstone usually comes in a light brown or red shade. Even-toned, it’s particularly popular with pool designers because they can order practically any quantity and not worry about variation in color. Hard enough to form Yosemite Valley, granite is certainly tough enough for your deck. Quartz is usually dark in color, water repellent, and has the ability to retain a shine that can give it a sophisticated quality, making it unique among stone pool pavers in Vero Beach, FL. Just like it sounds, coral stone is made up of coral and shell fossils and limestone. Although delicate-looking, it’s a remarkably tough stone, and is able to withstand severe weather, pool chemicals, and even running kids. There are a lot of beautiful options when it comes to pool pavers, so don’t choose lightly. Keep looking for the right kind of stone, and you’re sure to find exactly what you need.